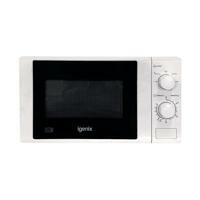 This microwave features a dial operation that is easy to use. With five different heat settings, this microwave is adjustable to your specifications, allowing you to always get the appropriate level of heat. The microwave even features a defrost setting, allowing you to thaw items quickly without any cooking. 20 litre/0.7 cubic foot capacity. Five power levels plus defrost function.